Well, if the first week of 2013 is anything to go by, I can confirm it's going to be a busy one. After a lot of trimming of half square triangles (actually not a lot of fun at 28 HST's per block!) 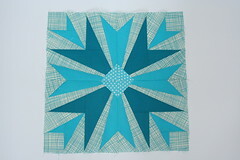 and matching up a LOT of seams, I have finished my first 6 blocks for the 3x6 Sampler Quilt Mini Bee (Group 13- Sampler). Colourwise not really my taste (and another awful picture, I think the sun has barely shone this week), but I felt a huge relief when I managed to get them finished. I was a little over-ambitious when I signed up for this 3 months ago, so I joined 2 groups, and still have 6 star blocks to make, paper pieced, like this sample I made in the first week! I have the feeling I might be a little paper pieced out at the end of next week, as I have a deadline for posting of 15th of January, that's just 8 days away, I am determined to get these done, I may be gone for some time!! What else have I been up to? 2013 started out as a winning year. I joined the lovely Erin at Sew At Home Mummy 's Simply Solids Bee at the end of 2012, and little did I know that she was running a little competition alongside it (I missed that in all of the original excitement), and I was lucky to win 1 of the 2 UK prizes (there is only one group of 12 in the UK, so the odds were pretty good). 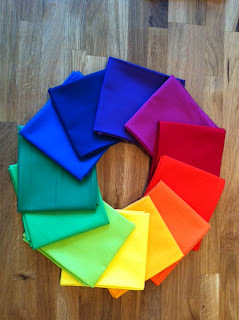 On Saturday, I received the most beautiful set of Rainbow Fat Quarters from The Village Haberdashery. Aren't they just stunning? And even more perfect in real life- I love them so, so much. Thanks Erin, and TVH you are the best!!! :)))))) I cannot possibly incorporate these into my stash, they are just too perfect together, I will be making them into a quilt or similar as a set- they just couldn't be parted. Next time I will have a little post about some fabric shopping (Rob, please avert your eyes to that one, you don't need to know, honest!). And I can tell you how very, very naughty Kerry @ PennyDog is, she made me do it, twisted my arm and everything (not really she's lovely, but she definitely encouraged me, which is a dangerous thing!). I do not think you need encouraging in any way, shape or form. Can't wait to hear what you got up to with Kerry. And loving the pattern of the blocks at the top, if not the colours. Good luck with the paper piecing! You'd better not be having second thoughts cos that was a BARGAIN and I'll have it off you :P I am still lamenting the loss of the turtle fabric. Oh and I got told off for spending £30- I don't think Alex knows the "value" of fabric cos I reckon I got a bargain. Your star block is lovely as is your rainbow. There's another Link Up you've brought to my attention - Damn you!!!! Hi! Wonderful blocks and those rainbow colours are perfect! Congrats on the win! I think a rainbow quilt quilt is in order. I really love that paper-pieced block you made. Good luck getting the rest of them done this week and thanks for linking up with Sew Cute Tuesday!